Remember that weekend escape I told you with the Trek 920? Well, now they have the Trek 1120 for a week, a month, whatever…a freakin’ world tour if you want. And, just look at it! The Trek 1120 should win awards and accolades for the industrial design alone. Also notice how Trek called it a touring bike, not bikepacking, gravel, or whatever flavor of the month nomenclature the bros come up with. Trek got their start making touring bikes and it’s great to see them double down in the category like this. It’s also way less confusing for customers in the market for a new bike to stick to categories they know, like touring. Available in 15.5˝, 17.5˝, 19.5˝, and 21.5˝ sizes, the Trek 1120 sells for $2,499. 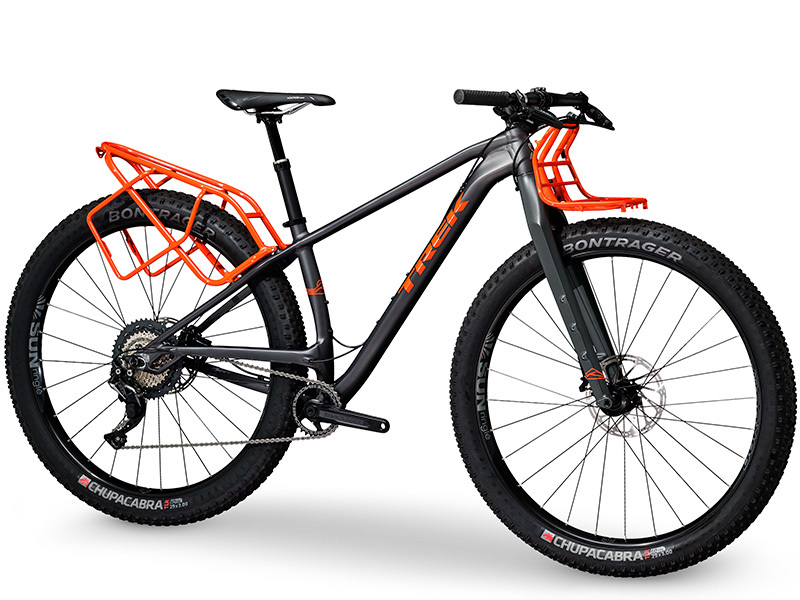 The Trek 1120 features their Alpha Platinum Aluminum frame and all-new carbon fork modeled on the Stache mountain bike platform, with slight adjustments to the geometry for a stable ride when the bike is loaded. Trek extended Stache’s mid-stay (a shortened, elevated chainstay) to lengthen the wheelbase for extra stability on rough trails, and the sliding Stranglehold Dropouts allow for adjustable geometry. The wide, Boost hub 29+ SUNringlé Duroc 50 rims support the super-tacky Bontrager Chupacabra 3” tubeless-ready tires. Shimano’s new SLX drivetrain provides an ultra-wide 11-46T gear range for climbing fully loaded. The Race Face Aeffect crank uses a durable, cinch-type steel chainring, and SRAM Level T brakes with 180mm rotors keep things under control on even the steepest descents. 1120’s trail-ready spec package is rounded out with Bontrager’s Drop Line dropper post and a swept-back Crivitz handlebar that provides a more natural wrist angle for extra comfort on long overland rides. The Trek 1120 features low touring mounts, and that cow-catcher rack with included bag system to carry a pair of standard dry bags (8L recommended) low to the ground for optimal handling. The rear rack also allows items like tents or sleeping pads to be secured on top. Trek 1120’s front rack maximizes usable space between the handlebar and top of the wheel to pack essentials within easy reach. Additionally, triple mounts on each fork leg accept virtually any bolt-on carry solution. Both racks can be removed with four screws. The Trek 1120 frame also has conventional rack mounts so that a full-size rack and panniers can be easily installed even more storage. The Trek 1120 frame also has conventional rack mounts so that a full-size rack and panniers can be easily installed if you want your own rack. As I said on Twitter, I’m not even into bike camping until I saw this bike. A weekend, sure, but I’m reconsidering with a bike this capable. 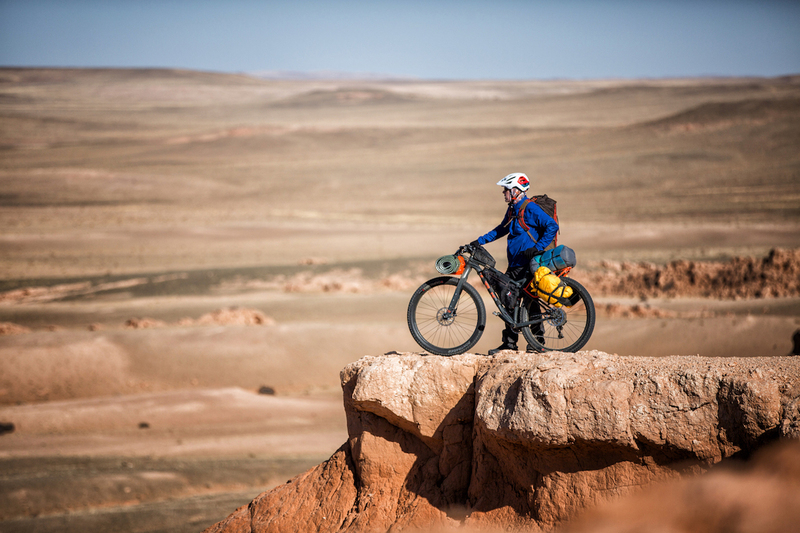 It’ll go anywhere you can pedal.